Visit to the The Haga Teaching Hospital, its trade union commitees and works council. The Haga Teaching Hospital has 4000 employees. It is the task of the works council to ensure that management objectives are aligned with those of employees. The members of the works council told about the issues they had discussed in the works council: for example TTIP ( Transatlantic Trade and Investment Partnership) and next to come TISA (Trade In Services Agreement). What are the threats for the labour standards? Labour and income? Sustainable mondial prosperity? Euopean levels of protection of the workers en civils? Does it affect the policy space of the government. Public services are not excluded by TISA. 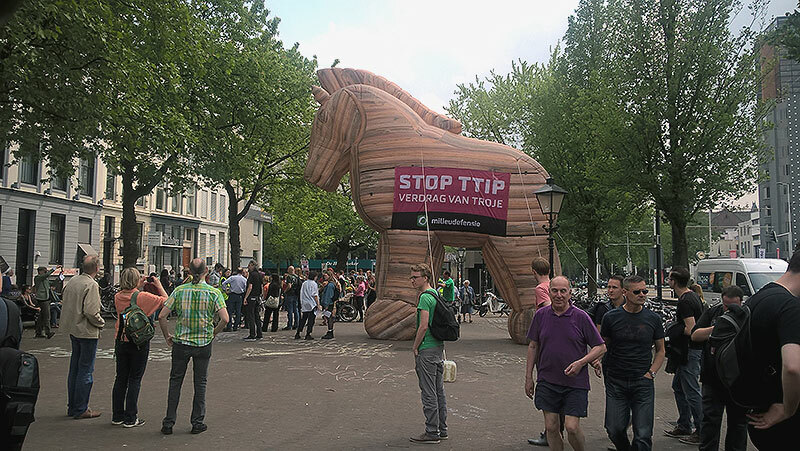 There’s no transparancy in the negotiations of TTIP and TISA. The works council is aware that TTIP and TISA are dangerous for Security Health Wellbeing and Environment. Trade Unions’ positions on TTIP & Co.
Trade unions all over Europe are discussing the impact of TTIP and CETA. To bring some light into the jungle, we have created an overview table of trade unions’ positions on this page (in order of name of country). The list is by no means comprehensive. If you spot any mistakes or would like to suggest additions, please email mailto:celia.wicher@hidemestop-ttip.org. Click the links to see the original position papers. Underneath the table, we have highlighted demands and main points of concern of some of the trade unions listed. The intranet page of the trade unions in the Haga Teaching Hospital was showed . Also the intranet page of the company first response team. The end of the visit was a visit to a lab.